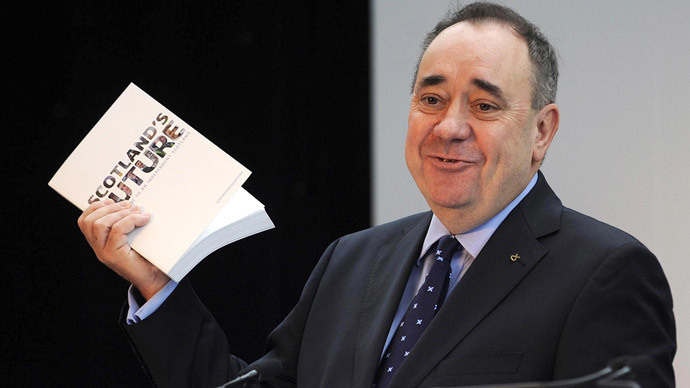 If UK ministers continue their “bullying” tactics to stifle the Scottish independent movement and block Scotland from adopting the UK pound as its currency, Edinburgh won’t take on its share of UK debt, warns Scotland’s First Minister Alex Salmond. The First Minister said that shutting off Scotland from sterling “would seriously damage the economy of the rest of the UK, as it would cost their businesses hundreds of millions of pounds a year, blow a massive hole in the balance of payments, and it would leave them having to pick up the entirety of UK debt,” Salmond said in response to George Osborne’s announcement, which was seen as a big blow to the ‘Yes’ movement to gain independence this autumn. “This is a concerted bid by a Tory-led Westminster establishment to bully and intimidate – but their efforts to claim ownership of sterling will backfire spectacularly in terms of reaction from the people around Scotland, who know the pound is as much theirs as it is George Osborne's,” said Salmond, the leader of the Scottish National Party (SNP). 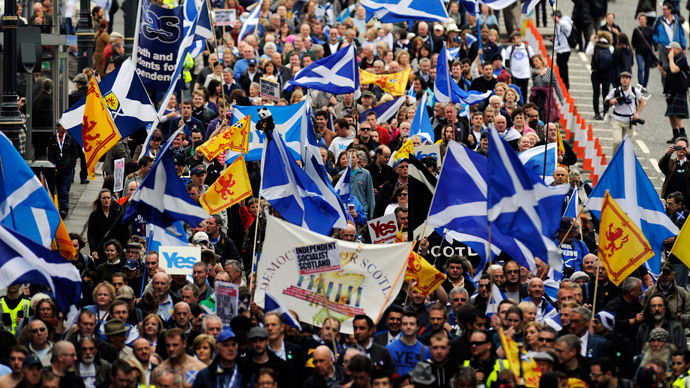 On September 18, four million people in Scotland over the age of 16 go to the polls and vote on whether to secede from the 307-year union with the UK. In a statement made in Edinburgh on Thursday morning, Osborne said if Scotland votes for independence it could no longer use the UK pound. “The pound isn’t an asset to be divided up between the two countries after a break-up as if it were a CD collection,” Osborne said on Thursday. Alex Salmond said that a currency union based on UK sterling is actually in the best interests of the UK government because Scotland, after the United States, is the second biggest buyer of England’s products. "We have set out a reasonable case that we should continue to use our pound because it is ours as much as it is anybody else's. Neither George Osborne nor anyone else can stop Scotland using the pound, which is just another reason why having a formal currency union will be in Westminster's overwhelming interests," Nicola Sturgeon, Deputy First Minister of SNP, said Thursday. Though only roughly a tenth of the UK’s economy, Scotland is highly integrated with London and sterling. Financial oversight and regulation, and North Sea oil, located in Scottish waters, is extracted and operated by the UK. Scotland’s biggest bank, Royal Bank of Scotland may be forced to relocate to London in order to keep business in the pound. 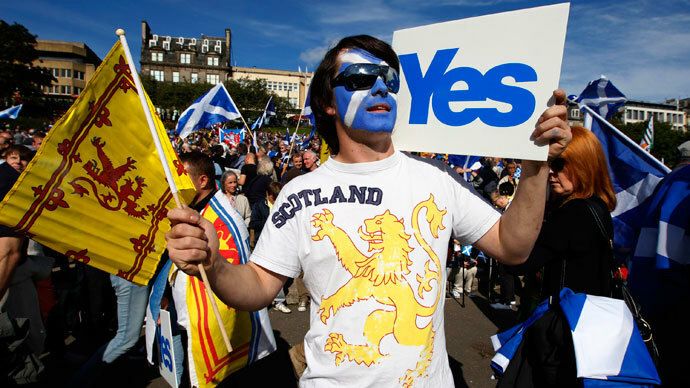 Lloyds Banking Group is also Edinburgh based, and would have to re-strategize in the event of Scottish independence. In January the UK Treasury confirmed that in case Scotland votes for independence, the UK would assume the responsibility for all of the $1.2 trillion UK debt . The independence movement argues separation would be better for Scotland because they believe it would provide a fairer balance between taxes and spending. Nationalists also claim debt per capita in Scotland is much lower in than in the UK overall. Scotland’s road to independence has been weighed down by one very fundamental question: on which currency will the economy run? If the UK sticks to Osborne’s statement, then Scotland is left with three options: introduce its own currency, introduce a currency pegged to sterling, or join the euro, an option the SNP has already ruled out.